This past Thursday and Friday were eventful days for the Seattle Mariners and fans of said major league baseball team based in the Pacific Northwest. There was talk of actual moves made and an eventual extension for a certain pitcher. Hector Noesi! No, that's just cruel. Right now, the details are still being hashed out, but all signs point to Felix Hernandez getting a 7 year, $175 million deal in the near future. And by near future, I mean possibly before spring training arrives. Also on Thursday, Kelly Shoppach and Joe Saunders were signed, Shawn Kelley was DFA'd and Jon Garland got put on the radar. Then Friday the Garland rumor became official, with the news of him signing a minor league deal with an invite to spring training. Since we're lacking a little more information in one paragraph, we'll delve into it after the jump. 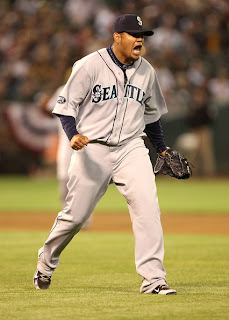 First and foremost, the Felix extension. Technically, the extension itself is 5 years at $139.5 million, with the other $35.5 million coming from the last two years of his previous extension getting blown up. Over the 7 years of the deal, his average annual salary will be $25m/season. Some might say this was a massive overpay on Seattle's part, but I'm not so sure. Granted, giving a pitcher $25 million per season, over 7 years no less, isn't exactly the wisest economic plan for the payroll. History has shown that long contracts for a pitcher tend to blow up in the team's face in one way or another. If Felix's arm decides to crap out (knock wood), then yeah, a little bit of an "oops" moment for the team. You can't predict injury, however, and having a player of Felix's caliber for 7 years at the price he's getting isn't exactly hampering the other aspects of the roster. Keep in mind, Seattle can get a new TV deal in 2015. Don't expect LA Dodgers type money, but a significant bump should be expected. Another argument is that Felix's ERA+ and average velocity have been declining since his rookie season. Well, duh. The ERA+ is a measure of a pitcher's ERA against the league average, which is not a static number. Expecting his ERA+ to climb above 175 into the 200's as he goes along is insane, not to put too fine a point on it. And his velocity, who cares? Yes, his velocity dipped towards the beginning of the year and it started picking back up in the second half become Felix figured out that being skinny with no muscle is not as good as looking big and getting power behind the ball. And the steady decline over the years can be attributed to his ability to pitch rather than just throw. He has the repertoire to get guys out without having to blow it by the hitter at 96 mph, so why let it fly and expend more energy in fewer innings when his change and curve can get the guys out just as well without trying to turn his arm into a rocket. Long story short, Felix is one of a small number of aces and is entering his age 27 season. Sit down, shut up and enjoy the ride. We covered the Shoppach signing, which became official on Thursday. Since it was a major league deal, room needed to be made on the 40 man roster. The victim: Shawn Kelley. It's not like there is a shortage of relievers out there, but losing Kelley still stings a little bit. What makes the move more surprising is that just a week ago, Seattle signed him for just over $900k to avoid arbitration. Instead of taking a deep look at the bullpen and Kelley's stats, we won't. Like, at all. Seattle has a deep bullpen with guys in the minors they can call up and free agents they can sign. Jack Z might be able to flip Kelley for a B prospect and get something in return. The likelihood Kelley will go unclaimed is as close to zero as you can get without actually touching it, so adios Mr. Shawn Kelley. I'm sure I'm not the only one who wishes you luck with whatever team you end up with. Last, but not least in terms of money, Joe Saunders and Jon Garland. We'll go with Garland first, since G comes before S in the alphabet. Or so my kindergarten teacher taught me. Garland signed a minor league deal with Seattle with an invite to spring training. With the rotation far from set, it isn't out of the realm of possibility that Garland breaks camp with the team. If he does, another move will have to be made to make room on the 40 man. That's for another time, if that possibility even comes to fruition. What we know about him is that he hasn't pitched since July 2011 because his shoulder scoffed when he went to throw a baseball off a mound and doctors had to open it up. His best season was in 2005 at the age of 25, sporting a 3.50 ERA in 221 innings, winning 18 games in the process. Other than that season, his greatest success has been in the National League, especially with the Dodgers and Padres, who play in pitcher friendly parks. With Safeco being pretty friendly to pitchers, he may actually do a semi-decent job. Probably better than Bonderman anyway. Remember he signed with Seattle on the same sort of deal? Yeah, I didn't think so. Anyway, he's a pitcher that doesn't walk many guys, but also doesn't strike them out either. He's averaged 4.9 K/9 over his career, but who knows. We'll see what happens in spring training. We also have Saunders. His deal isn't yet official, but according to a tweet by Ken Rosenthal, the deal is for one year at $6.5 million with another $1 million possible in incentives. There is also a mutual option for '14, but I would imagine that would be declined if one of Seattle's pitching prospects is ready to join the rotation. Then again, if Saunders does well, he may end up staying. This is one of those wait and see type things, obviously. In a nutshell, Saunders is Vargas but without the alarming track record of an increasing home run rate. He'll give up his share of bombs, but not what Vargas has been doing lately. Saunders is a little older than Vargas, but not Millwood age older, so there shouldn't be too much worry about him breaking down later in the season. Overall, a decent signing to help shore up the rotation. I've written more about a guy out of baseball since 2011 than a guy guaranteed to make the rotation. I find that sad, yet I can't summon the energy to change that. All in all, a pretty good couple of days for the Mariners. No blockbuster deals, but the only possible blockbuster signing out there is Bourn. I'm okay with him still being on the market. You know who isn't on the market any more? Chone Figgins. Figgins signed a minor league deal with the Miami Marlins. Figgins was signed before Bourn. If baseball doesn't make you laugh, you're just not paying attention. Awesome Inc. theme. Theme images by Leontura. Powered by Blogger.